The Government expects HM Land Registry to become “a more digital data-driven registration business” – and we will have no more important partner in realising this ambition than the Government Digital Service (GDS). 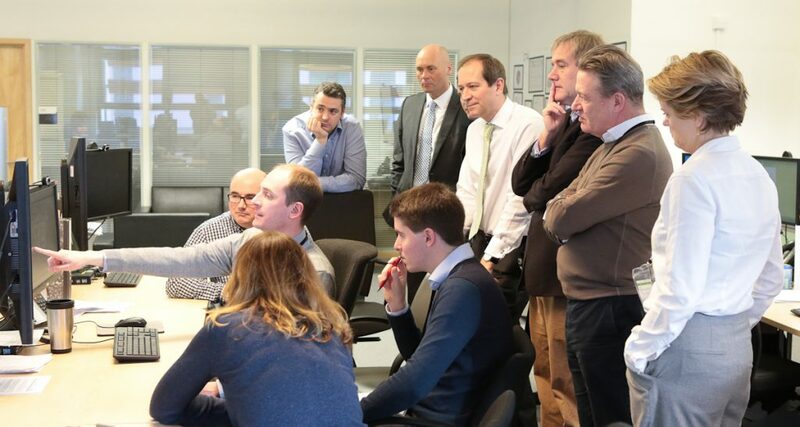 GDS has been working with us on our digital projects for a number of years and we were delighted to build even closer links by welcoming Director General Kevin Cunnington and several of his colleagues to our offices in Croydon recently. Kevin (pictured second right) was appointed last year and this was the first time he has had the opportunity to visit HM Land Registry. The day-long session was arranged to give the GDS team a closer understanding of our role and plans so we can work together as productively as possible. The day started with Kevin and the team being given an overview of HM Land Registry’s role, history and evolving Business Strategy by Chief Executive Graham Farrant (pictured fourth right). Following this introduction, the team saw a live demonstration of how we process land registration applications as an understanding of ‘casework’ is vital before any of the processes are digitised. A casework team showed Kevin and his colleagues how property is registered and talked through the complexities and challenges. Our Digital Services Director, John Abbott, took the team through a more detailed look at the data we hold and how it could be used in the future to support the wider aspirations of the organisation and government. We then spoke about the new services we are looking to build and how they will be used by our customers. The day culminated with an open discussion around how HM Land Registry and GDS can work more closely together to reach our shared objectives of making digital services that are simple, clear and easy to use. Several follow-up actions and sessions were identified to build on the success of the day. The overall day was very relaxed and interactive and everyone agreed it was a really useful opportunity to shape the relationship moving forward. Kevin was very enthusiastic about the direction that HM Land Registry was taking and how GDS can help and support us.